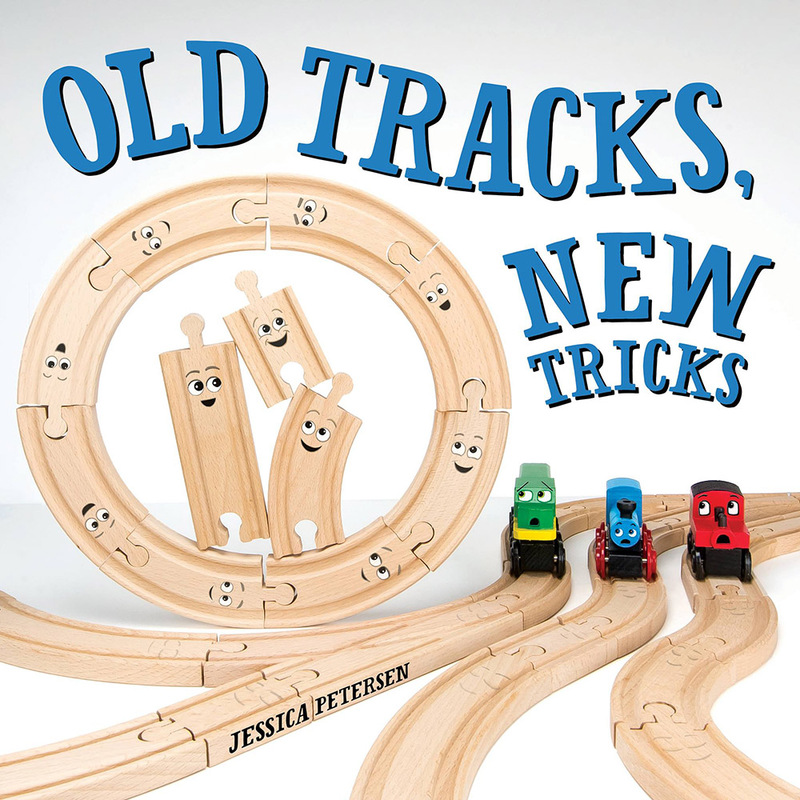 Old Tracks, New Tricks, is a story about three little wooden train tracks who shake up an old wooden train set. But it’s so much more than that. It’s a way to inspire children to invent new fun with their old favorite toys, and to value and celebrate the creativity of others at the same time as confidently sharing their own ideas. The Innovation Press has provided a free preview of the first ten pages, so you can see if Old Tracks, New Tricks would be a good fit for your child, school, or library. Then to read the rest of the story — and see all the amazing “tricks” the tracks end up doing! — you can order a copy online or ask for it at your local bookstore! Wooden train tracks Trixie, Tracky, and Tinker are thrilled to finally join a train set of their own, but their excitement derails when they discover things at their new home are not what they expected. Bossy wooden trains blare orders, and the old tracks snore on the floor. But with a little creativity, the three new tracks work together to prove that you really can teach old tracks — and trains! — new tricks. 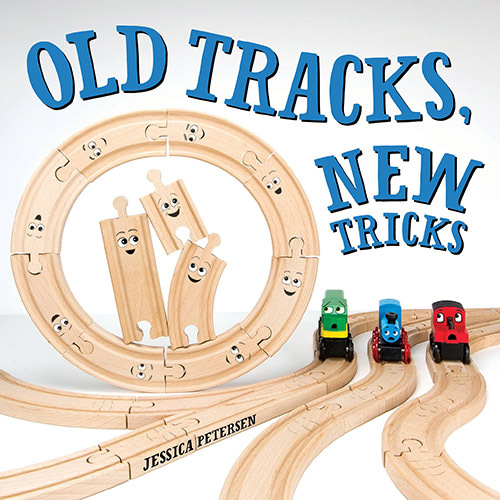 Old Tracks, New Tricks is a story about three little tracks who bounce back after a disappointment to stand up for their right to be creative and have a say in how the train set plays. But it’s also the story of three little trains who learn to not just accept but value the creative ideas of other toys. Ultimately, they all figure out to play and create together. A jaunty rhyme and inventive toys-come-to-life spin on challenging the status quo, with especial appeal to fans of all things Thomas. If you’re the parent of a train-loving kid, or a teacher of preschoolers or kindergarteners, you’ve probably read a lot of train books. I know I have — some of them over, and over, and over. But what I always hoped to find was a book that reflected the way my son and so many other girls and boys play with the toy trains that are out there in today’s world, especially wooden train sets. I wanted a book that encouraged kids to push those train sets to the limit, inventing new and exciting ways to play with them. I wanted a book that made it easy for parents and teachers to engage in that kind of creative train play that has allowed me to connect with my son and teach him so many things through what he’s passionate about. So I wrote that book. On every page of Old Tracks, New Tricks, kids will see the familiar toys they already love brought to life. 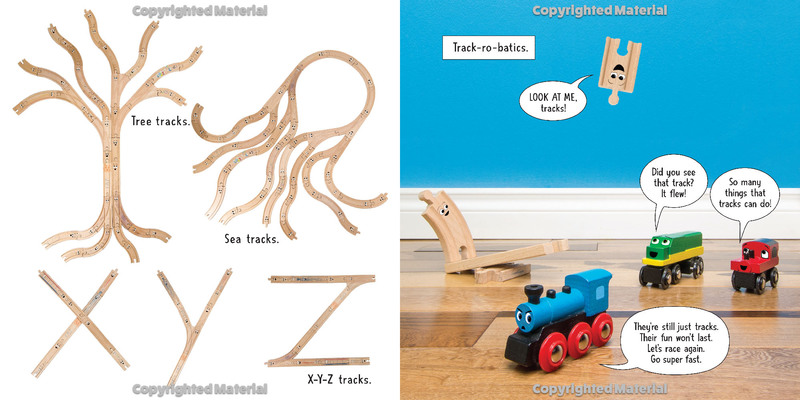 Throughout the story (but especially in the second half of the book, when things really get fun), the little tracks demonstrate a whole trainload of activities — combining everything from engineering to music to art to literacy (and more) with trains. Almost all of these activities can been done with toys and materials that are commonly found in many homes and classrooms. In the back of the book, there are instructions for all of the activities (many of which can be done with other types of toy trains and tracks as well as wooden ones). But perhaps my favorite part is the kid’s guide to inventing, testing, and documenting their own track tricks, acted out by the characters from the book. …that’s really a book about how to play, create, and explore. While wooden trains and tracks are the focus of the story, the creative process the tracks and trains demonstrate can apply to anything a child loves to play or create with! Toddlers will find joy in seeing the fun and funny faces of the toys smiling up from the pages of the book. 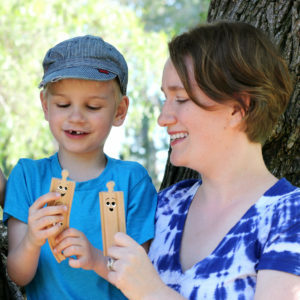 Preschoolers will be urged on in playing with their favorite toys in creative ways…or perhaps will be inspired to play more with wooden trains if they aren’t already playing with them often. Kindergartners and older kids will be inspired to keep taking their trains — or whatever their old favorite toys are — out of the toy box by the idea of inventing something new. Even More Track-tastic Fun — and Learning — Online! Plenty of “track-tivities” inspired by the book — and ones sent in by little engineers from all over the world. A place to submit your own track trick photos (for a chance to have me add faces to them, just like in the book!). An extensive list of train activities for kids (enough to keep any little engineer busy for a very long time). Plenty of fun printables — coloring pages, activities, bookmarks, posters, and more. A trainload of resources for teachers, librarians, occupational therapists, and speech therapists to use Old Tracks, New Tricks with their students, patrons, and clients (including many freebies over at Teachers Pay Teachers). Information about events that the tracks and trains (and me, their creator!) will be appearing at. You’ll also want to check out the Old Tracks, New Tricks Instagram account for lots more fun, and I often post behind the scenes photos on the Play Trains! Instagram account, too. 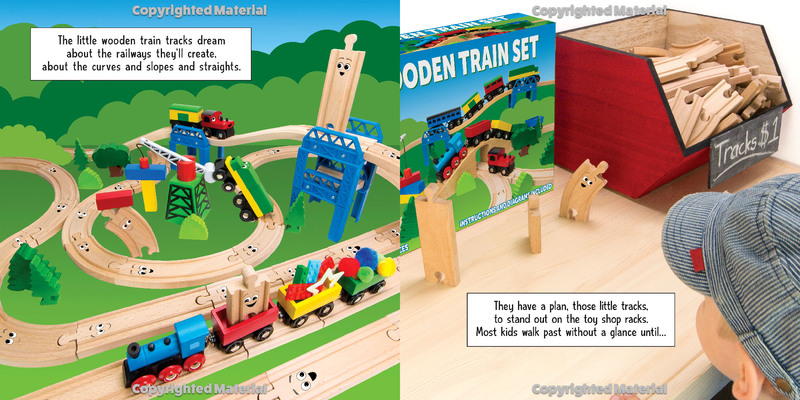 Creating different train track designs is one of our favorite ways to play with trains. This book sounds like something my boys would enjoy. Thanks! It sounds like they would have a lot of fun with the book! Congrats on your book! So exciting! It definitely sounds like one I want to share with my daughter, too! What a fun and engaging way to look at playing trains with kids. My two girls are both obsessed with transportation in general and I think this would be a really great addition to our homeschool library. It sounds like Old Tracks, New Tricks has many lessons for kids to learn. I love a good story with opportunities to build children’s character and to get them thinking. Looking forward to reading your book! Oh, I’m so excited for this book. I love the message and it will be perfect for train lovers too. Oh what a fantastic book. I love that it encourages such creativity. My kids played with the same train set on the book cover when they were kids. That sounds like such a fun book! Those wooden tracks are precious. They remind me of when my son was a toddler and first got a set of trains. So many people get rid of the wood train sets when their kids are starting kindergarten…but if you leave them in your child’s room, it is amazing what fun ways to play with wood train tracks they will come up with. My 7 year old still gets his out and uses army men with them now. This looks like so much fun. My son would have loved this when we were entrenched in his train phase through the preschool years. Congrats on writing a book! So impressed. We are ready to pull out train table out for my youngest two kids. This book will go along so nicely with train play! Congratulations! I love the idea that you are encouraging such creative play with trains and their tracks! What a creative idea for a book! I love that the book can be paired with train play — I really think kids learn to apply life lessons when they can get hands-on with a story. Your book looks wonderful! Congratulations! My boys love playing with their trains. While my oldest is more interested in setting up the tracks, my youngest is all about riding the trains. I think they would love your book. Fun! I love encouraging kids to try new things and this would help make the toys last longer, to boot. Such a great book, especially for train lovers like my Bulldozer! We just love trains! I know what I’m getting my little train over for Christmas! I love that your book focuses on what you do so well on your blog, encouraging kids to use their train tracks in inventive ways! We can’t wait for this amazing book!! !